NGC 7129 crop....TEC140 @f7 and FLI ML8300 camera on Tak NJP mount. Lum 1x1 21x10m RGB 2x2 each 21x5m. NGC 7129 is a young compact star forming region which displays an unusual patchwork of colorful nebulosity and bright stars contrasted against the dust clouds of the Milky Way. The astronomical correlate of those colors and textures is the rich interplay that occurs between young stars and the surrounding interstellar medium. 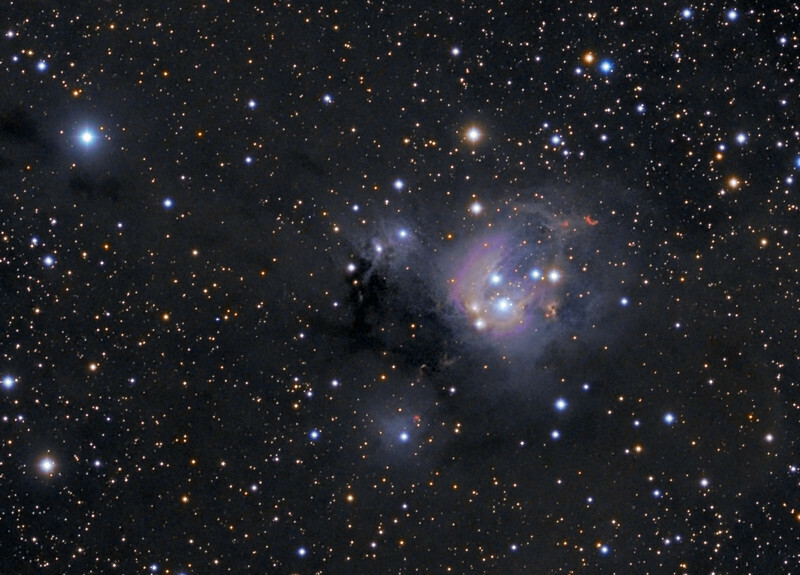 NGC 7129 contains several bright reflection nebulae including the large blue reflection cloud NGC 7133 and the unusual small yellow reflection cloud LBN497. Also conspicuous in the field are several bright Herbig-Haro objects, the signatures of young stellar objects soon to emerge in the main sequence. The dominant blue reflection nebula, NGC 7133 is illuminated by two young B-type stars BD +65°1637 and BD +65°1638. Both stars are less than one million years old and represent the core of NGC 7129, a small cluster of low mass stars which populate the 36 light year wide cavity. BD +65°1638 is the older of the two illuminating stars and has played a critical role in the formation of NGC 7129. Around 100,000 years ago the ultraviolet radiation field from the young star began to burrow a cavity into the surface of a nearby molecular cloud. As the cavity expanded, a ridge like interface formed where the expanding cavity contacted the molecular cloud, triggering an intense period of contained star formation. The bright stars went on to illuminate the ambient dust surrounding the cluster, forming the brilliant reflection clouds we see now. The environment of NGC 7129 is a fertile star forming region where numerous young young stellar objects (YSOs) exist. Energetic outflows from several young protostars are the power source for several Herbig-Haro objects which populate the ridge along its northeast and southwest regions. These objects take their name from George Herbig and Guillermo Haro who first described them over 50 years ago. Today over 300 individual HH objects are known. These fascinating objects form when an energetic outflow from an infant star ionizes adjacent gas clouds in the slightly denser interstellar medium. The nascent stars are invisible optically but reveal their presence when they release highly collimated jets of ionized plasma which shock the surrounding interstellar medium. The shocked gases form a small compact emission cloud called a Herbig-Haro object (HH). Typically HH objects are found in active star forming regions. Today well over 300 individual HH objects are known in our galaxy. Although NGC 7129 is quite impressive at optical wavelengths, over 50% of the cluster stars are highly obscured young stellar objects, only detectable at infrared wavelengths. Cloaked by dense envelopes of dust and gas that characterize their early evolutionary stage as they contract towards the main sequence, they are mostly invisible at optical wavelengths. There are two major outflow sources within NGC 7129 that likely power many of the prominent Herbig-Haro objects. One source is an imbedded protostar adjacent to the unusual Herbig Be star LkH 234, a highly evolved pre-main sequence star located along the northern ridge. Herbig Ae/Be stars are intermediate mass pre-main-sequence stars analogous to their lower mass counterpart, the T-Tauri stars. An outflow of molecular gas arises from a source very close to LkH 234 and extends out some 26 light years along the ridge and into the cavity, powering several prominent Herbig Haro objects lying nearby to the northeast including HH 105, GGD 34, and GGD 35. The second major outflow source is located along the southern ridge and is known as FIRS 2. This protostellar system is likely the power source of the Herbig-Haro objects in the southwest of the complex, namely GGD 32 and the largest Herbig-Haro object in NGC 7129, HH 103. The ages of the cavity and protostellar objects within NGC 7129 seem to coincide and are about 100,000 years old.